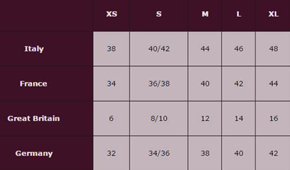 Your measurements are important for our tailoring services. Before buying a dress it is important to accurately take your measurements to make sure that the garment you are buying is exactly your size and will fit you perfectly. The conversion data are only suggestions. When purchasing from our website, since it is impossible for us to take your measurements and especially for our “Made to order” garments, it is crucial that you provide us with very accurate measurements, that you must specify when placing your order. 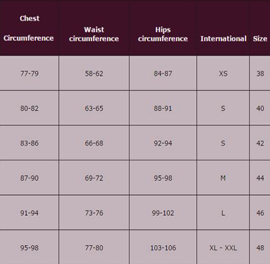 Check your size according to our table. It is very simple; it only takes a few minutes and a common measuring tape. Take the circumference of your chest, waist and hips. Chest Circumference: Take the exact measurement of the circumference at the widest point. Waist: Take your measurements and add 1-2 cm to the final result. Hips: the measurements must be taken at the most protruding point. Lenght of the leg: Take the length of the leg from the hip to the floor. Please do not forget to include your height; it is an important piece of information to us especially when making skirts and trousers.